What’s up with Lord Ganesh? Lord Ganesha was sitting silently in that idol shop. He was idle like all of the idols. 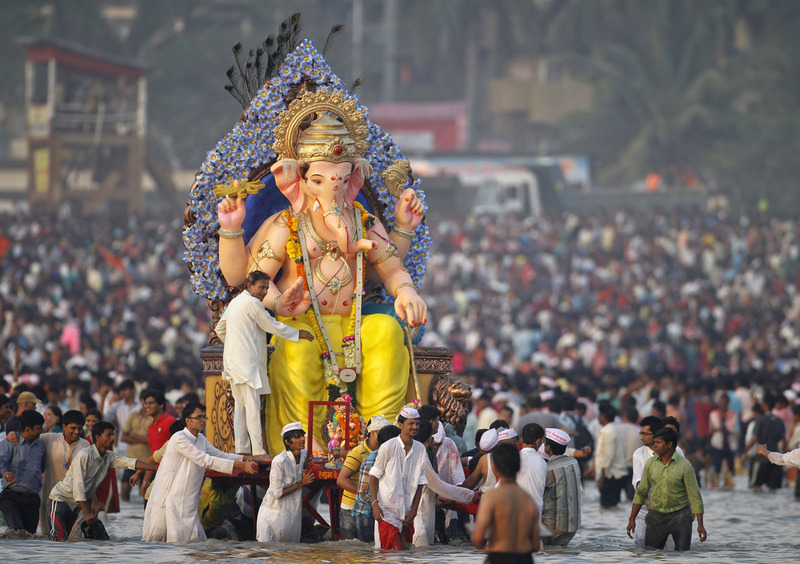 Despite, he was 7 feet high and had more colors on his body unlike all other Ganeshas. That difference said he is high in cost. His pal the rat even though not much colorful sat under his foot looking in a direction which meant nothing. As soon as the morning sun started to peep out from the mountain light rays had become more intense in that idol shop. At that time something unusual happened. Lord Ganesh felt like he is subjected to some irregular movement. He has been lifted by a group of people and escorted to a mini lorry. Ganesh was confused, but he couldn’t do anything except staring as usual. As soon as he got seated properly in the lorry it came to life. The engine has been ignited and slowly started moving. At that time Ganesh noticed his pal the rat is missing. He shouted, but none could hear that. A small kid who was sitting near to Ganesh in that lorry shouted, “Thatha the rat is missing….” His grandpa, who was the lorry driver put a sudden brake and shouted “Useless workers! Go and get that Raghu!” Raghu, that kid ran to the idol shop and came with the rat. Ganesh became happy after seeing his pal. 15 minutes later Ganesh was sitting in his usual position under a big tree where a small hut like structure has been erected nocturnally. Then he became the hero. Many devotees started coming in to get the blessings from him. But Ganesh had some other thoughts in his mind. Two days he was in the idol shop. But no one cared of his existence there. They didn’t give any signs of respect these days. Even some people came with Sandals and Shoes on their legs, which Ganesh thought it was very offensive. But now? Everything is different. The tables turned. He is very confused why this sudden change. A guy who came to get the blessings was distracted by his mobile ringtone. He talked on the phone, “Hey today is Ganesh Chathurthi! And you have an office? That’s so unlucky dude! We are enjoying here…” Then Ganesh remembered its his birthday! He had completely forgotten about that. He becomes happy on seeing all his devotees celebrating his birthday happily. He was sitting in a camphor-agarbathi environment surrounded by his favorite flowers and foods. Even his pal the rat was very happy, but he felt annoyed by much crowd because he is very timid. Time passed by. Now Lord Ganesh is the most happiest God in the world. He can feel the jealous eyes of other Gods were on him. He felt like the hero of a super duper hit movie. He poured all his blessings to all his devotees who passed him. More time passed by may be a few days. The crowd is decreased. And again a group of people came near Ganesh and lifted him. The same lorry was waiting and Ganesh is properly escorted again to that lorry. This time they didn’t forget the rat. And the lorry started moving slowly and more crowd followed Ganesh. Again Ganesh thought this was another form of respect and felt very proud of the hospitality of his devotees. He again poured his blessings. Then all of a sudden the crowd turned away from him. They started moving in a particular direction. Ganesh wondered why they are doing this! Then he saw a very big Ganesh, gigantic than him in all aspects. About 10 feet. And he pulled more crowd towards him. Our Ganesh thought, what’s wrong with this person? He is just taller than me so what difference does that make? As soon as the tall Ganesh passed away in another direction, crowd resumed with our Ganesh. After that there is no stop. He is moving faster than before. Stopped nowhere even though many devotees wanted Ganesh to stop, but the lorry didn’t. It moved at a constant speed. Then all of a sudden the lorry stopped. The crowd before Ganesh paved way for a bunch of white ambassador cars with red light on its head. Some people, well dressed in white and white came near Ganesh to get his blessings. He understood that they are some big politicians. But he wondered why the lorry stopped just for these people, but not for other devotees! Soon he found out the reason. One man gave a bundle of some 1000 rupees to the priest. Ganesh wondered for what he needs money. He has no idea what to do with it. Then he realised that the money is not for him, but for the priest and others. He felt disappointed by this inequality. Then the lorry moved very fast now. It reached the seashore. Ganesh thought what they are going to do now. Same bunch of people took Ganesh out from the lorry and the priest started chanting some mantras, which Ganesh knows for sure that most of his words were wrong. 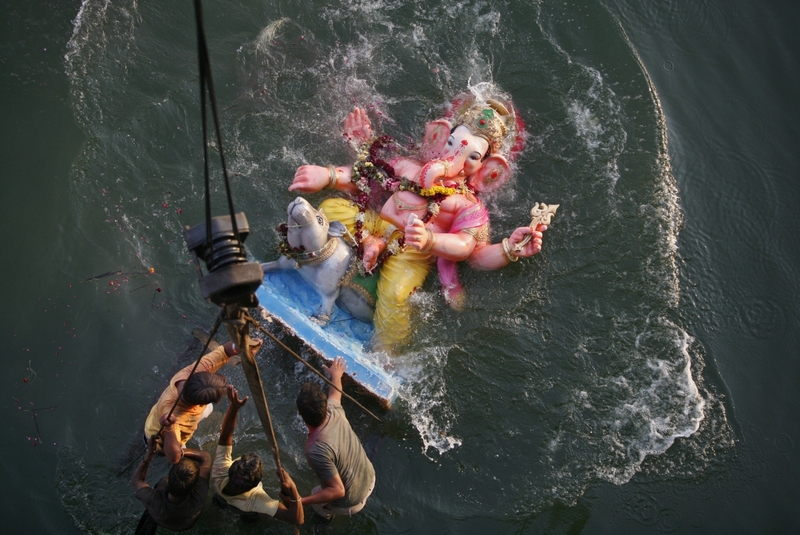 Then, with a crowd of people shouting Ganesh name he was thrown into the sea with his pal the rat. He sank and went deep in the sea. Still, he could hear the echoes of people calling his name. It faded away as soon as he reached very deep in the sea. 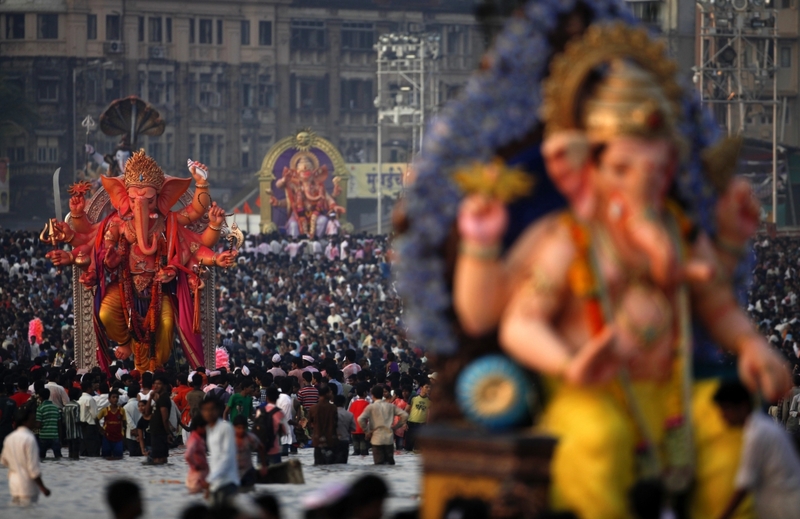 There he saw the tall Ganesh which he met on the road, the crowd puller. Our Ganesh smiled like, “Oh, you are already here!” Tall Ganesh gave a look like “Welcome dude!” Many fishes gathered around our both Ganeshas but went back suddenly after realising its not a food. Ganesh understood fishes don’t pray they just look for food. At least they are same all the times. But he wondered why this mess happened? First, he was in an idol shop where no one cared. Then in a hut where people treated him as a king and now in the sea wondering what’s wrong with this person? He thought he should’ve never left the idol shop. But now it’s all over. He will soon become a mere toxic in the sea since he is full of paint and oil. He thought no sea creatures should die because of him. But now nothing in his hand. He sat silently like all the times! The curious case of Āryabhaṭa: respected and reviled.